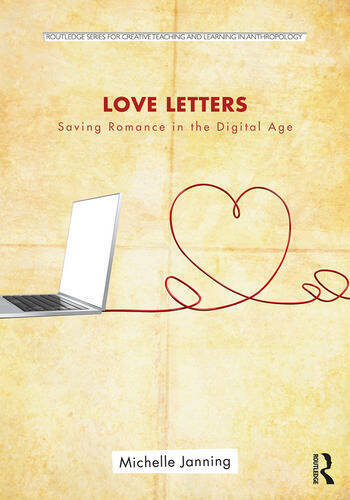 In today’s world of Tinder and texting, do we write and save love letters anymore? Are we more likely to save a screenshot of a text exchange or a box of paper letters from a lover? How might these different ways to store a love letter make us feel? Sociologist Michelle Janning’s Love Letters: Saving Romance in the Digital Age offers a new twist on the study of love letters: what people do with them and whether digital or paper format matters. Through stories, a rich review of past research, and her own survey findings, Janning uncovers whether and how people from different groups (including gender and age) approach their love letter "curatorial practices" in an era when digitization of communication is nearly ubiquitous. She investigates the importance of space and time, showing how our connection to the material world and our attraction to nostalgia matter in actions as seemingly small and private as saving, storing, stumbling upon, or even burning a love letter. Janning provides a framework for understanding why someone may prefer digital or paper love letters, and what that preference says about a person’s access and attachment to powerful cultural values such as individualization, taking time in a hectic world, longevity, privacy, and keeping cherished things in a safe place. Ultimately, Janning contends, the cultural values that tell us how romantic love should be defined are more powerful than the format our love letters take. Michelle Janning received her Ph.D. in Sociology from the University of Notre Dame. She is Professor of Sociology at Whitman College in Walla Walla, Washington. She has published numerous book chapters and articles on family relations and material culture, authored the book The Stuff of Family Life: How Our Homes Reflect Our Lives (2017), and edited the collection Contemporary Parenting and Parenthood: From News Headlines to New Research (2018). She has received a Fulbright Specialist Grant and teaching awards, and her work has appeared in national and international television, radio, Internet, and print outlets, including U.S. News and World Report, Real Simple, The Verge, Author Story, and Positive Parenting Radio. Go to www.michellejanning.com to learn more.